As the midterm elections approach, a small army of organizers will be answering calls and knocking on doors in hotly contested districts around the country with a simple question: Do you have what you need to vote? Plenty of groups, including the ACLU, have used the judicial system to take aim against the growing number of strict voter identification laws, attempting to convince the courts they unfairly target certain groups, particularly low-income voters, minorities, senior citizens and people with disabilities. But VoteRiders, a nonpartisan nonprofit based in California, takes a different tack. Since 2012, the organization has led a grassroots operation to help voters adhere to each state's individual requirements — rather than fight them through lawsuits. And it is beefing up its operation ahead of November's elections, deploying hundreds of staff and volunteers across the country as Democrats, targeting over 100 seats in Congress, look for a wave and Republicans try to maintain control. Kathleen Unger, VoteRiders' founder and CEO, told NBC News that efforts will be particularly robust in states with competitive House, Senate or gubernatorial races, including Arizona, Wisconsin and Florida. She was moved to create the group after the 2010 midterms election, anticipating a slew of new voting restrictions. Justin Levitt, a constitutional law professor and voting expert at Loyola Law School in Los Angeles, said organized voter education efforts like VoteRiders' are an important complement to any legal challenges. The laws create confusion that doesn't magically disappear with a court decision, he said. "Before the 2016 elections, the state Supreme Court issued a bunch of decisions that theoretically made ID easier to get and it lowered the burden on paper," he said, referring to Wisconsin's voter ID law, one of the strictest in the nation. "But in order satisfy what the court set out, there's still a difficult bureaucratic process and voters have to show up at the right place, at the right time with the right stuff gathered." Currently, 34 states have laws requesting or requiring voters to produce some form of identification at the polls, according to the National Conference of State Legislatures. President Donald Trump has said that voter ID laws are essential because the system is "rigged." But Anita Johnson, the Wisconsin coordinator for VoteRiders, has seen firsthand how the requirements prove a barrier to the ballot box for many. Wisconsin's law, which requires a state-issued driver's license, state ID, passport, military ID, naturalization papers or tribal ID to vote, was swiftly challenged in court. A federal court found in 2013 that more than 300,000 Wisconsinites lacked the ID required by the law. In July 2016, a federal court ruled that the law was unconstitutional and that an alternative to showing an ID, such as signing an affidavit attesting to one's identity, must be allowed. But, in August 2016, an appeals court ruled that the law could be implemented as long as the state agreed to publicize the law and provide temporary free IDs to those in need. The 2016 election was the first time the law was fully in effect for a presidential race, and Trump won the state by 1 percent, or roughly 22,000 votes. Some experts blamed the law for suppressing the votes of minorities, senior citizens and college students — particularly in Milwaukee — who tend to vote for Democrats. In one instance, Johnson assisted a 91-year-old woman whose license had expired (the law requires a current ID) and had decided not to cast a ballot until VoteRiders took up her case. "She was gonna give up and she felt like she couldn't vote anymore," Johnson said, adding that the woman did not know seniors can get permanent IDs that do not expire. "That's how confused she was about the ID process." That's why Johnson spends her days on a dizzying journey around Milwaukee, its surrounding areas and more rural parts of the state, where residents find it hard to navigate the bureaucratic catacombs of the Department of Motor Vehicles and find it difficult to understand what's required. "We’re doing everything in our power to raise the number of people to vote," she said. "Sometimes everybody doesn't think voting is a big thing, we still have to encourage people that this is your duty to vote." Johnson talks to neighborhood associations, the homeless, barbershops and even drives people directly to the DMV. 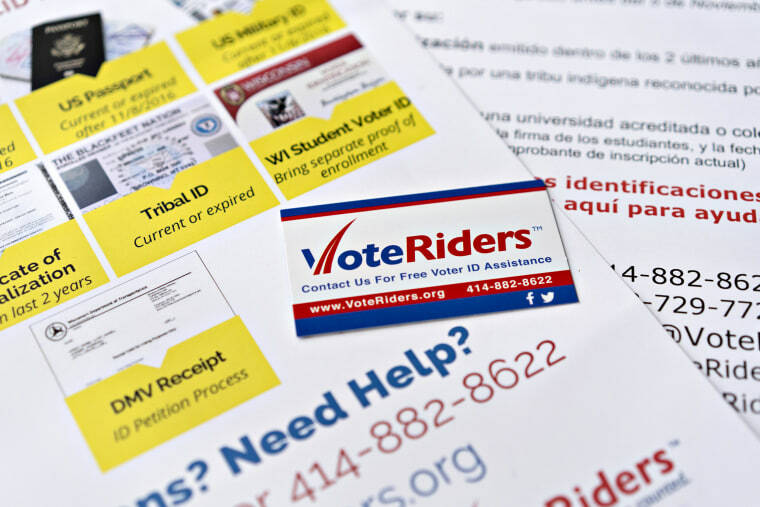 Voting rights experts say that organizations like VoteRiders make a difference on a grassroots level, but lawsuits are still important to make sure no one is disenfranchised by voter ID laws. "All of these efforts are key, we need a multi-tiered strategy to fight back against all of the restrictions we see when it comes to ballot access," said Kristen Clarke, the executive director of the Lawyers' Committee Under Law and Civil Rights. "But, we want states to know if they put a discriminatory voter ID scheme on the books they will face a lawsuit." Still, Levitt, the Loyola professor, notes that litigation presents an "enormous bureaucratic hassle" that doesn't immediately provide relief for the people most affected by strict voter requirements. No matter what laws are in place, he said, "there are still going to be people who want ID, who need ID, who find it difficult to get." CORRECTION (Feb. 10, 2018, 12:30 p.m. ET): A previous version of this article misstated the year VoteRiders was founded. It established in 2012, not two decades ago.